Whether you're looking to get a little healthier, lose a little weight, or you're still experiencing the effects from heavy holiday food, here are a few simple steps you can take to clean up your diet that will get you back on track. Water, that is. Drinking more water flushes out toxins in the body, and helps to avoid eating when you are really just thirsty. Remember, your body can only absorb so much water at a time. For this reason, it is better to sip throughout the day rather than trying to squeeze in your daily intake in one or two sittings. Carry a (BPA-free) reusable water bottle with you and see how many times you can refill it. 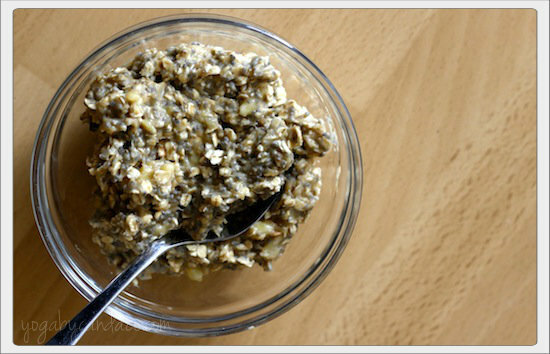 Get rid of store bought cereals and other processed breakfast foods (pop tarts, eggos, etc). They are loaded with genetically modified corn and genetically modified sugar (here's why that's a big deal), and refined flour. Instead, make your own granola, or start the day off with oatmeal prepared the regular way or try a gooey peanut butter banana version, or an oatmeal cookie. Besides being a healthier option than cereals or processed breakfast foods, these meals will keep you feeling satisfyingly full for longer, thus preventing you from eating more. Rule of thumb: If you can't quickly and easily pronounce all of the ingredients on the list, put it back on the shelf. Ditch the foods with labels that have MSG, corn syrup, and artificial sweeteners (here are the 4 most dangerous artificial sweeteners). It's time to branch away from the rice. Make an intention to try a new grain once or twice a week. Quinoa is like the king of the grain world. It's a complex carb with a low glycemic index that's packed full of protein, has twice the amount of fiber as most other grains, contains iron, B12, magnesium- I mean the list can go on and on. Try a red quinoa casserole, or a quinoa salad. Other great grains to consider: millet, barley, bulgur, amaranth, and buckwheat. I don't believe in ignoring cravings. But if I'm craving something, I'd rather put a healthier version of it into my body if I can. If you're craving chocolate, have dark chocolate (75% cacao or higher). If you're craving a dessert, try a healthier version of a cookie or a cake. If you're craving a cocktail, substitute fresh squeezed fruit juice for the sugary fruit drinks or soda water with a squeeze of lime instead of 7UP. If you're craving pizza, try a whole grain or cauliflower crust and load the veggies on top. Ultimately, don't completely deprive yourself because then you'll just be frustrated and angry. The perimeter of the grocery store is where all the fresh food is located. The more processed the food, the deeper it is in the store. Fresh foods are obviously healthier and shopping the perimeter can help control the amount of sodium, sugar, fat and processed foods that go into your body. 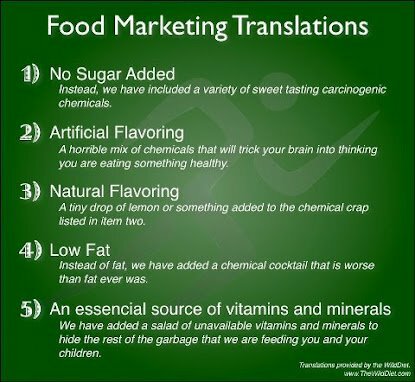 I have to hand it to the food industry- there is some "good" marketing out there that tricks us into thinking products are healthier than they are. Take vitamin water, for instance, which is marketed and branded with bright, beautiful colors, has desirable names like Focus and Endurance and a slogan that tell us to, "Hydrate Responsibly." It's full of sugar! Or Naked Juice, whose bottle informs us that there's "no sugar added", and is "all natural", yet is now facing a lawsuit for using GMOs and chemicals in its "Non-GMO" and "All Natural" products. Be wary of products that are trying to convince you of its nutritional value. If it sounds too good to be true, it probably is. PS: More recipes and health blog posts here.